There are not enough times you can write “criminal proceedings initiated against Sepp Blatter”. But there you have it. That’s what happened on Friday September 25, 2015, when agents from the Swiss Attorney General’s office knocked (no doubt politely) on the door of FIFA’s Zurich headquarters and told Blatter he had some questions to answer (and, while we are here, give us your computers to look at). Blatter, of course, has long denied any knowledge or any involvement in any of the corruption that has seeped into the very fabric of FIFA. Blatter takes that position despite being the thread that embodies the filthy rag that is modern FIFA – sewing together almost every deal involving the organization during his 41 years as either Secretary General or President of the world governing body. Michel Platini and Sepp Blatter ask how they ever got here. Blatter appears to become unraveled by a discount 2010 and 2014 World Cup TV rights deal he gave (who else?) to Trinidadian pirate Jack Warner for around $600,000 – a figure that seriously undervalued those rights and short-changed FIFA from a market rate. As Associated Press reported, Warner then went on to sell them for an incredible $20 million. 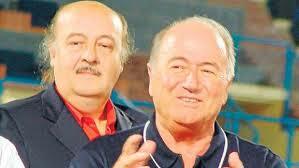 The investigation also uncovered a payment from FIFA to UEFA President Michel Platini for around $2 million. This payment was apparently for work Platini had done for FIFA over three years between 1999 and 2002. The moneym however, did not drop into the UEFA President’s bank account for nine years. My own record for late payment from a customer is three years – I finally received a check for a few hundred dollars after waiting in the company’s lobby and telling the accountant I wasn’t leaving until I had my cash. They paid. I left. Platini did not appear in such a rush to get $2 million. Then again, I never played for Juventus, either. So, of course there are questions about Blatter’s relationship with Platini and what the payment was actually for. Rule number one: follow the money. Rule number two: cross check the dates. Platini received the payment when he decided not to run against Blatter for FIFA president and instead endorsed Blatter’s reelection. Ouch. Please make that not be true. Ouch. Too late. 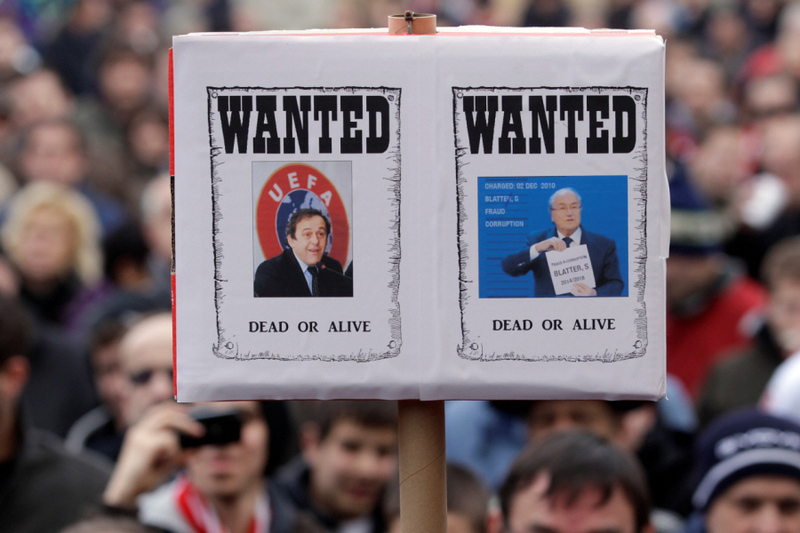 Some football fans have had issues with Platini and Blatter for some time. There had been recent calls from FIFA reformists that Platini was cut from the same cloth as Blatter and would be little different as President from the current regime if he did succeed the Swiss next year. The current allegations question whether Platini is now even suitable to stand for the Presidency. 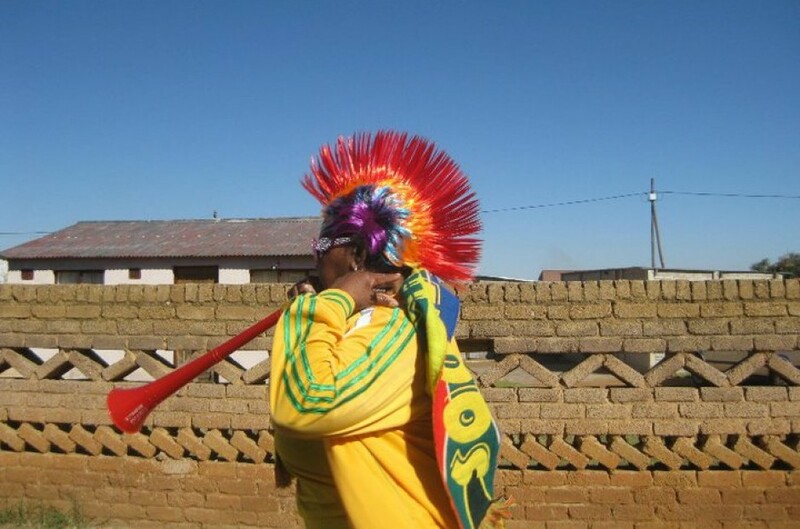 FIFA Ethics Committee says it will investigate. Continuing the theme – and keeping in mind Platini voted for Qatar to host the 2022 World Cup – Fairfax Media in Australia reported the incredible allegation that Peter Hargitay, a so-called “consultant” for Australia’s World Cup bid, was at the same time working for Mohamed Bin Hammam, the Asian Football Confederation President, pulling the strings on Qatar’s bid. 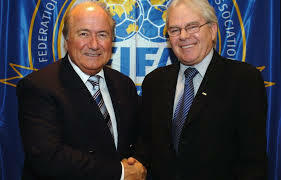 The report also suggested former FIFA Ethics Committee member Les Murray – at the time a senior editorial executive with SBS Television in Australia (the World Cup rights holder for that country) – was under Hargitay’s influence and played an active role in a dirty tricks campaign against Sheik Salman, the Bahrain football boss running to unseat Bin Hammam from the Qatar’s place on FIFA’s Executive Committee. Sepp Blatter and a cheerleader (update: actually SBS TV broadcaster Les Murray). 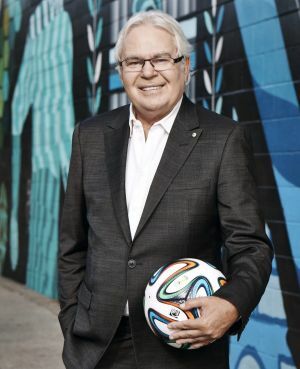 The extraordinary claims by Australia’s hand-picked bid consultant, Peter Hargitay, raise questions about the role of legendary SBS commentator Les Murray, and whether Australia’s $46 million taxpayer funded bid ever stood a chance against the piranhas of world soccer. Documents obtained by Fairfax Media show that, in April 2009, as Mr Hargitay was taking $1.45 million from Australia for its 2022 World Cup bid, he was also being paid more than $500,000 as a consultant for the man who was the driving force behind the Qatari bid, Mohamed bin Hammam​. In a subsequent invoice to Mr Bin Hammam, dated April 14, 2009, Mr Hargitay said his services included “co-operation with SBS TV, development of storyline, supply of core information, editorial input and raw data for further research”. The day after Mr Hargitay’s invoice was lodged, on April 15, Mr Murray used his position on FIFA’s ethics committee to launch a complaint against Sheikh Salman, adding that he had been able to find more evidence to corroborate the vote-buying claim. In his letter, Mr Murray said Mr Bin Hammam’s allegations had come to him in his “professional role as a journalist for SBS television”. An SBS spokesperson said “Mr Murray was not part of any team except that of SBS”, a quote which will give a smile to many people with insight into the relationship between Murray and Hargitay. Murray loved the attention a supposed mover and shaker in the world of football politics like Hargitay offered and, as the “consultant” would boast, never hesitated to do Hargitay’s bidding when requested. 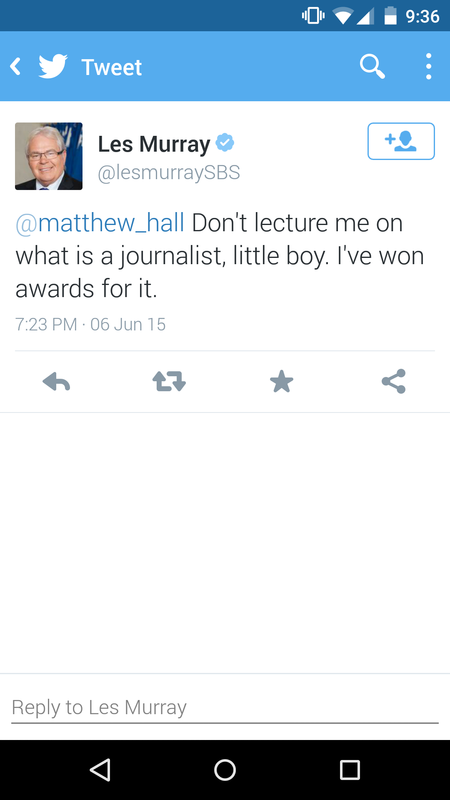 Full disclosure: Murray has not taken any criticism well and publicly described me as a “little boy”. This was taken as the compliment it was no doubt intended to be. Award-winning journalist Les Murray tweets. For a detailed insight into how Murray operates it is worth some time to take a look at this incredible and forensic look into Murray’s behavior over the past decade – an almost tragic postscript to a broadcasting career that once offered so much to Australian soccer fans. Read “There’s Something About Les” here. While Hargitay is entitled to take his fool’s gold fee from Australian taxpayers, Murray surely has questions to answer that go beyond denials from an SBS spokesperson. SBS currently seems incapable or disinterested in pursuing what can be wrapped up as an “old story” but it is true that the environment Murray operated in and that much of football still operates in (with people like Blatter and Platini as role models) allowed for questionable behavior to thrive. The guy in front is Sepp Blatter. Behind him? Peter Hargitay, a beneficiary of fool’s gold. Blatter was allowed to exist in a vacuum of morality scrutinised by only a handful (and that means handful) of media. Certainly in Australia, the media was silent in critically analyzing the country’s bid. I know. I was a one of less than a handful of journalists tackling the Aussie propaganda that people like Les Murray puffed like a cheerleader, complete with pom-poms and high kicks. On a broader note, it is no coincidence that every word the British investigative journalist Andrew Jennings ever wrote on Blatter and FIFA is now being proven true and his work over many years pursuing FIFA’s crooks is now thoroughly vindicated. It is also no coincidence that Jennings was once described by Les Murray (supposedly a fellow journalist, remember) as a “discredited moron”. Who is the discredited moron now? Hopefully, answers to some questions will make that very clear. Regarding Fink’s highlighting of how Murray supported Blatter in 2011, but changed his mind four years later. One could point to the fact, that while Fink is gung-ho about getting rid of Lowy in 2015 – and I agree with him wholeheartedly – the same Fink told me that he was one of those who met with Lowy years ago, begging him to re-enter Australian football’s management. Same difference, as the saying goes. Time passes, people who are capable of re-examining their beliefs are also liable to change their opinions. As they should be.